It isn't by coincidence that the Streamlight Vantage C-4 LED helmet-mounted light is one of our top selling products out of thousands. This little guy may be small, but he's a tough, indestructible, waterproof, powerhouse-of-a-light, that's for sure. The Vantage has C4-LED technology, which is 3x brighter than high-flux LED's and up to 10x brighter than most first generation firefighting flashlights, many of which are still out there today. This little light puts out a blinding light that will NOT let you down in emergency situations! This light was made specifically for our Firefighters--you. The beam of light has a hotspot that pierces smoke, dust and darkness, yet still able to light up your peripheral vision areas. This flashlight will run at it's amazingly high illumination for four hours, and then after that, still continue for another two hours with slightly diminished output, but still useful for non-critical and backup situations. The Vantage is meant to be mounted either above or below the brim of your helmet as it's manufactured with a 360* swivel clamp which can be adjusted for the perfect beam location to fit your needs. The added blue LED taillight off the back helps to keep you visible to your partners who are following, or searching--even when in a smoke-filled room. It's obvious why this flashlight is such a popular sell--because it truly lives up to the hype and expectations of our customers. 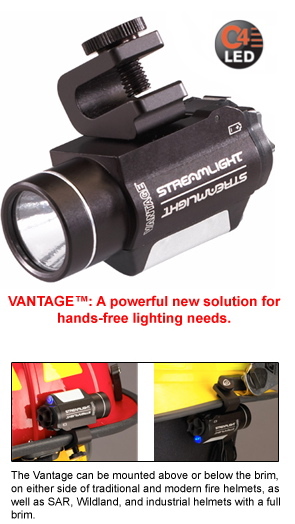 If you don't yet own a Streamlight Vantage, consider checking one out today.